You need to have the root privileges to run R‑Studio Agent for Linux. Unlike R‑Studio Agent for Windows and R‑Studio Agent for Mac , R‑Studio Agent for Linux is a console application and should be run in the Terminal. You also need to mark it as an executable before start. When it is started for the first time, R‑Studio Agent for Linux asks for its configuration. Specifies addresses and a subnet mask from which this computer can be accessed. Enter 0 to allow connections from any address. A TCP/IP port for incoming connections. Press Enter for the default one . Don't pay much attention to the warning about "unregistered demo version". 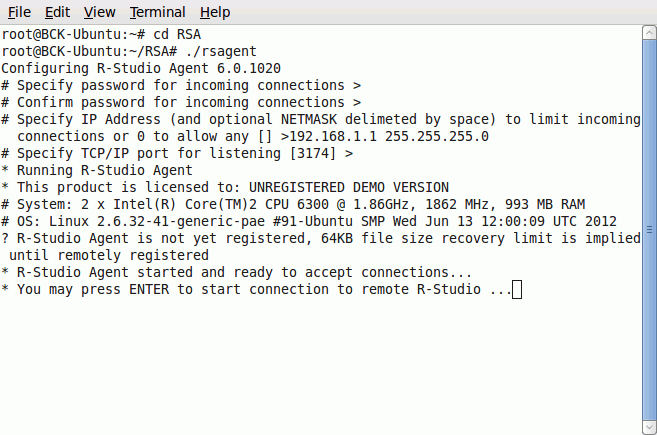 If necessary, you'll be able to register R‑Studio Agent for Linux through R‑Studio . You may see the current configuration by starting R‑Studio Agent for Linux with the command rsagent --show_config . You may change the current configuration by starting R‑Studio Agent for Linux with the command rsagent --configure . Connecting from R‑Studio Agent for Linux to R‑Studio. > R‑Studio Agent for Linux will connect to the computer where R‑Studio is running and it will show the hard drive and logical disk structure of the remote computer.